Wi-Fi HD Cameras | VTech Wireless Monitoring System | Smart Home? Smart move. Need an extra set of eyes and ears at home? 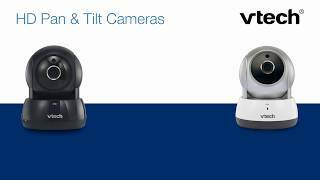 With a high-definition IP camera from VTech, you get both. These wireless video cameras let you see and hear what's happening in any room from any mobile device, so you can check in and know what's going oneven when you're out. Log in and look around from anywhere. With a pan & tilt camera, you can adjust and zoom your camera using a smartphone or tablet to really get into the details. Plus, you can set the camera to record based on motion to give you peace of mind while you're away. Feel at ease day or night with features like automatic night vision, motion-activated recording, and smart alerts sent to your mobile device when the camera senses motion. Talk with people or pets through the camera when you can't be there. Or, send your videos to friends and family to let them in on special moments. 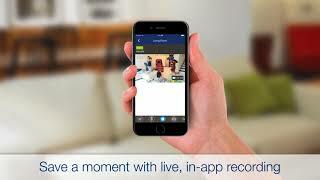 Access your video anytime, anywhere with a mobile device and the free MyVTech Cams app, available for Android and iOS. Use the app to set up your camera with a mobile device. Securely stream video from anywhere, day or night. Watch the kids get settled in or the pup helping himself to your dinner, while it's happening in real time. Ten infrared LEDs let you see what's going on, even if the lights are out. Extra-long range means you can place your VTech HD Camera farther from the router while enjoying a stronger signal and less interference.